Trump is expected to back up his tweets from earlier in the day threatening a shutdown of the federal government over funding for his proposed border wall. Trump came out and mentioned winning Florida by a lot. @RepDeSantis speaking now, off the bat praises ending Iran Nuclear Deal, supporting Israel, nominating Kavanaugh, each with applause from audience. Longest applause comes for the idea of "ending illegal immigration." Trump says Florida has "two unbelievable people," @RonDeSantisFL and @FLGovScott , who are fighting for America. Encourages audience to vote Bill Nelson out. "Wouldn't you think they get tired of these speeches?" Trump asks of media that cover him. Trump says "it' a lot easier to act presidential than to do what I do"
"I can be more presidential than any president in history, except probably Abe Lincoln .... I admit it, Abe Lincoln is tough"
Trump says "it's a lot easier to act presidential than to do what I do"
Trump says you need to show your ID when buying groceries, but not for voting. "My only special interest is you the citizens of the United States," Trump said. "I've had a great career ... and then I ran for president with no experience and I won." Trump touting his role as a political outsider, says he was only in DC 17 times prior to running for president. Says he didn't know anyone in DC, now he knows everyone in DC. Trump says he believes Republicans are close to 100% on approving Kavanaugh nomination. Says Democrats want to obstruct the vote because they don't want Trump to have credit, even though they know approving Kavanaugh is good. "China is maybe getting in our way, but we're going to figure that one out before you can even think about it," Trump says. "I think it's going to work out very well -- no tests, no rockets flying, we'll see what happens," Trump says of North Korea. 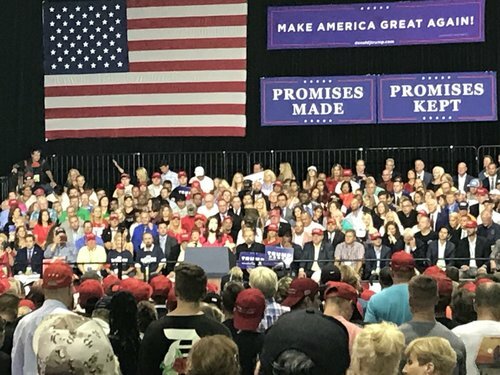 Trump's finale: "We are ... one glorious nation under God, and together we will make America wealthy again; we will make America strong again; we will make America safe again; and we. Will make. America great again." - last part in unison w crowd. After that line, a recording of a choir started playing, followed by "You Can't Always Get What You Want" by The Rolling Stones.